“You should meet Chief Kanyama”, said my friend, Vincent when I told him about Faming God’s Way. “I’m sure he would want to hear about your program. But unfortunately, he’s already left the boma” [village]. “Are you Chief Kanyama?” I asked. “Yes,” he replied, hesitantly, a bit bemused. I quickly introduced myself to him and asked whether he would be available that day, as I would like to tell him about Farmiong God’s Way. And graciously he agreed to a 16h30 appointment. Later, after I had shared with him about Farming God’s way while we sat under a thatched gazebo he kept repeating something to his retainer (assistant) in the Lunda dialect. I noticed there was a hint of tears in his eyes. His retainer turned to me and translated: “The Chief says he’s overwhelmed. He’s overwhelmed…overwhelmed! Apparently over a period of six years the Chief had promises from two guys who had offered to train his villagers in Farming God’s Way, but they had failed to follow through on their promises. Now here before him was an “old” lady who had come all the way from South Africa – whom he did not know – who was available to do the job. In September and October 2009 I trained Chief Kanyama and thirty-six of his villagers in Farming God’s Way. In the past two seasons they have reaped more than in their entire farming history.2010/2011A fall in February 2010 in which my collarbone and thumb broke meant I could not return in May 2010 to follow up on the training with Chief Kanyama’s villagers. This was particularly disheartening as the accident set the five-year oversight programme back a full year. But by July 2011 my passion (and the Lord’s) to settle in Mwinilunga could no longer be delayed, and by 15 December 2011 I was on my way, lock, stock and barrel (the saga is recounted in http://backthewaywecame.wordpress.com/). Sadly, all communication was lost between Chief Kanyama and myself between 2009 and 2011due to consistent cellphone and internet network failure, and miscommunication at other times, via an intermediary. 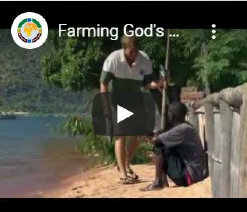 This truly is a success story and validates the belief that Farming God’s Way is the way to go.